In early May London’s Barbican Centre showed its audience the lost and re-discovered propaganda films of the Marshall Plan. Produced between 1948 and 1953 these films taught the wider Western European public about democratic values and free trade market principles. The Barbican screening was made possible through the Selling Democracy Project, curated by Sandra Schulberg and Ed Carter. For all propaganda film nostalgics out there: Some of the films shown at the Barbican’s are also viewable online, via the Film Archive of the German Historical Museum. All available material comes with valuable English descriptions. And yet another “vraie trouvaille”, free of charge: The German Newsreel Archives. The archives are in the process of being set up, but so far 6044 items can be called up. 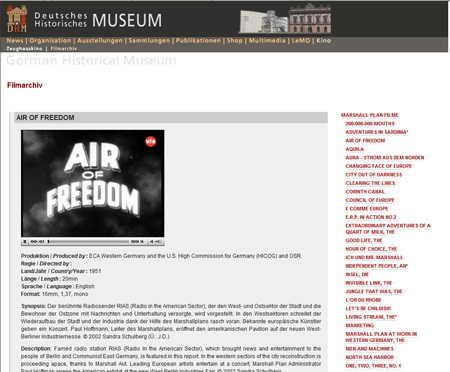 Screenshot: German Historical Museum Film Archive. Check out the ISN Special Report Safeguarding Security in Turbulent Times for views from Nayef Al-Rodhan, Anne-Marie Buzatu, James A Lewis, Alyson JK Bailes on issues to watch during these changing times. Emmanuel Clivaz’s Private Contractors on the Battlefield, an ISN Case Study, examines the he emergence of private military contractors and the theoretical components of the flexibility-control balance in a theater of war. You can find it in the ISN Digital Library. And the latest addition to our Links Library is The SecDev group, an operational consultancy focused on countries and regions at risk from violence and insecurity. In what I think is a very good piece of international affairs analysis, Daniel Möckli of the Center for Security Studies at ETH Zurich comments on the new US policy on Iran and the Arab-Israeli conflict. Möckli talks to Swiss-German radio’s Echo der Zeit, Switzerland’s flagship news program, on the impact on Israel of Obama’s policy . “There are signs that US policy on Iran takes a direction, which does not necessarily meet Israeli interests” says Möckli. “Israel is obviously unsettled”. The interview comes at a time when Israel’s president Shimon Peres voices support of the new US approach, even though the prime minister and his government are tough on Iran and the Palestinians. Möckli also comments on the Swiss government’s engagement in the Middle East. According to him, the Swiss government has decided to no longer mediate between Iran the West on the nuclear issue, due to domestic political reasons. “I personally regret this, because we’ve been very successful there”. Daniel Möckli has been a guest of ISN Podcasts, where he discussed Swiss Mideast policy. A policy brief he wrote on Switzerland’s controversial policy in the region can be accessed through the ISN’s Digital Library.